Some positive action to be taken by the Cooncil over neglect of the old GPO building in George Square? I'd astonished if they actually took this action, but they are at least making positive noises. been prime location for office development. I've never understood why the council never allowed Stefan King to turn it into a hotel, it would have been fantastic! Although, Im not entirely sure i this was down to the fact G1 only owns the northern half of the building? the Evening Times wrote: And one prominent Glasgow MSP has accused the G1 boss of making a mockery of Glasgow's Scotland With Style brand. Anyway, heres hoping something comes out of all this, such a waste (and embarassment) it sitting there practically derelict. crusty_bint wrote: I've never understood why the council never allowed Stefan King to turn it into a hotel, it would have been fantastic! Although, Im not entirely sure i this was down to the fact G1 only owns the northern half of the building? Last edited by red_kola on Wed Mar 16, 2005 4:50 pm, edited 1 time in total. wasn't the huff caused when the cooncil made King take down his hugely profitable billboards on the grounds that he appeared to be doing nothing with the building? Cyclo2000 wrote: wasn't the huff caused when the cooncil made King take down his hugely profitable billboards on the grounds that he appeared to be doing nothing with the building? red_kola wrote: IIRC, the original sticking point was the lack of planning permission to put in a pool/leisure club in the basement. Without this, the Hotel would have been ineligible for Five Star status. Ahh, I wonder why they wouldn't have given planning consent for a basement installation??? *cough tunnel? May be a bit fanciful, but I wonder, I can't think of any good reason why they would refuse consent to to do any excavation works for a pool, it cant be the the depth or flood risks as the low-level and subway go deep, as does the basement of the Debenhams building on Argyle St. Real shame though, Stefan King is known for his quality of build, Im sure he'd have done a sensative thorough job. crusty_bint wrote: Ahh, I wonder why they wouldn't have given planning consent for a basement installation??? *cough tunnel? . Great minds eh? or is that fools? You do realise youve just pinted out a duplicate thread now don't you, Fossy will NOT be pleased ( )! Right, everyone that posted here, go post the same thing in that other (earlier) thread, coz if I do it it will just be me quoting you in. Funny you should mention local tv, we got Thistle Tv out here in lanarkshirem and the North and South Lanarkshire use it as a mis-information station on how great they are doing spending our money. They practically own the thing. Wasn't that because he was making more money out of the billboard than he could have done if he'd been renting out office space or hotel rooms? Councillor Steven Purcell, the Leader of Glasgow City Council, today (Monday November 28, 2005) officially announced that the former General Post Office building in Glasgow has been sold to developers. Today's announcement has come after Councillor Purcell's personal intervention. It now paves the way for the long-awaited regeneration of the landmark building on George Square, Glasgow's principal civic space. The current owner G1 Group Plc, the Glasgow-based property and leisure group, have agreed to sell the building to joint venture partners AWG and HF Developments, both of whom have extensive experience in commercial development. 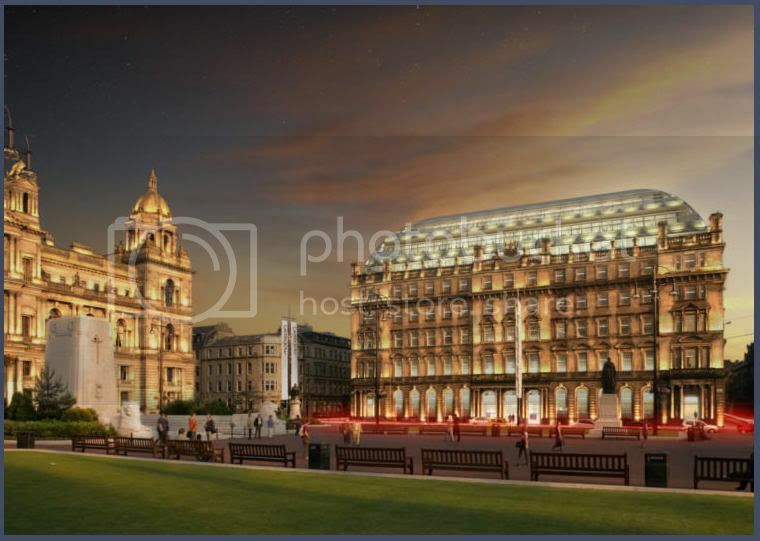 The cost of the redevelopment of the building at No 1 George Square will be in region of £50 million. The development, which envisages the building converted into high quality office space, is due to be completed in 2008. Councillor Purcell said:" I am delighted to make this announcement. Like many other Glaswegians, I have been worried that such an important building has remained vacant despite its prime city centre location. "It was obvious that action was necessary to get the building developed. I used my influence as Leader to help facilitate negotiations to ensure that this 124-year-old building is given a new use in the Glasgow of the 21st century. Leaving it vacant was not an option for me or the Council. I'm delighted that Stefan King agreed and has worked with us for the good of Glasgow and this building. "I have emphasised to both G1 Group and the potential purchasers how important the project was and impressed upon them that if a deal was to be struck it should be done so as soon as possible. I'm now happy to see that the proposals for the building will be of a very high standard and will reflect this listed building's importance to Glasgow and its citizens." Stefan King of G1 Group, said: "When Councillor Purcell approached us regarding interest shown in the building, it was at a time when we still considered No 1 to be a long term property hold. However he encouraged us to meet with the interested parties, which persuaded us to review our strategy. We are delighted that HF/AWG share G1's aspirations for a top quality development for this key city centre site and wish them every success. "The sale of No 1 creates massive opportunities for the G1 Group to continue its growth in Glasgow and the rest of Scotland. G1 has completed several award-winning projects in the city over the last few years. We look forward to generating further good news stories for Glasgow." The 124-year-old Victorian building occupies a prime city centre site at No1 George Square opposite Queen Street Station and Glasgow City Council's headquarters at the City Chambers. The property was the General Post Office city headquarters until 1995. G1 Group has owned the former GPO building since 1999 and has pursued several development options in the interim. However, the Group was not able to identify any suitable redevelopment proposals, which would fit with G1's extensive leisure portfolio.